The VPAM BRV 2009 standard is a ballistic vehicle resistance standard developed in Germany for armored vehicle testing against various caliber ammunition. Unlike the CEN standard which only tests and certifies the material used in the construction of an armored vehicle, VPAM BRV test the whole vehicle and not just the materials used. First, the Beschussamt Mellrichstadt technical team analyzes the armoring design of the manufacturer in order to identify any potential weak points of the vehicle. This information is then utilized during the testing process, where the test projectiles are concentrated in perceived “weak” areas, such as the joints, doors, and pillars. In order for a vehicle to pass and be awarded the VPAM BRV2009 VR certification, it must defeat every single projectile fired upon it i.e. there could not be even one penetration to the vehicle. Please see VPAM Standards for the different levels of certification available. The most common one used for commercial armored vehicles is the VR7 level certification which provides protection against 7.62 x51 and 5.56 x 45 rounds. The IAG armored Toyota Land Cruiser 200 Convoy® is one of the first BRV 2009 VR7 certified armored vehicles in the world. International Armored Group‘s armored VR7 Toyota Land Cruiser 200 Convoy® is one of the first armored vehicles in the world to be fully certified under the VPAM BRV 2009 standards to level VR7. The certification test was conducted independently by the internationally acclaimed laboratory for ballistic testing Beschussamt Mellrichstadt in Germany. The BRV 2009 standard is significantly more comprehensive than the older and out-of-date VPAM BRV 1999 VR6 test. Certified armored vehicles under the BRV2009 standards, such as IAG’s VR7 Landcruiser Convoy®, offer superior ballistic protection and blast protection when compared to vehicles without this certification. IAG is amongst the first manufacturers in the world to obtain the VR7 certification based on the more stringent requirements of the BRV 2009 standard. 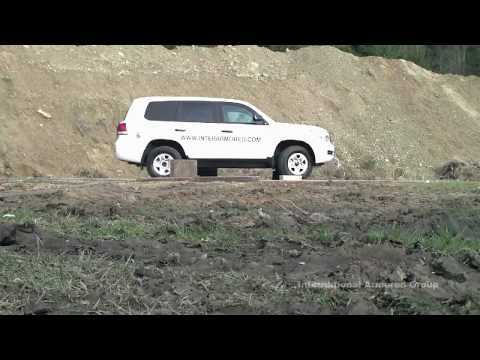 As part of the BRV 2009 VR7 certification process, extensive ballistic testing was conducted to assess the design and construction of the vehicle armoring. First, engineers from Beschussamt Mellrichstadt carefully analyze the design and manufacturing process, as well as, examine the finished vehicle for any potential weaknesses that should be tested during the live fire test. If a bullet fully or even partially penetrates the vehicle’s armoring, it constitutes a failure. 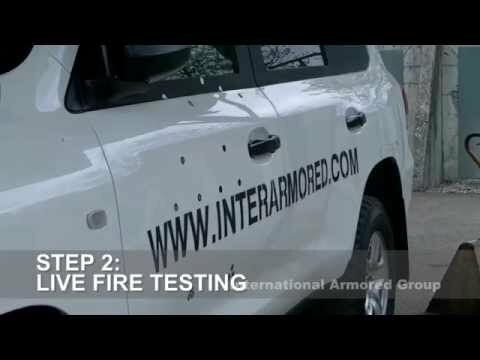 During the live fire testing procedure, the IAG Convoy® armored VR7 Toyota Land Cruiser withstood over 400 7.62x51mm and 5.56x45mm rifle rounds fired from all angles at all sides of the vehicle, including the windows, roof and rear hatch, in addition to obscure areas such as door seams, pillars, handles and other potential weak points in the armoring. After 5 days of testing, the IAG Convoy® sustained no penetration in the cabin area, effectively neutralizing any ballistic threat up to the CEN B6 level. The test vehicle was inspected after each blast. The IAG Convoy® sustained no deformations or penetrations in the armored passenger cabin, effectively shielding the occupants from the shrapnels and pressures of the various explosives.